Flight attendants can earn a good living doing something many people only dream about: traveling the world for work. The Bureau of Labor Statistics projects that this job will grow 10 percent between 2016 and 2026, faster than average for all occupations. It also boasts median annual earnings of over $50,000 per year – no college degree required. But this job isn’t all glitz and glamor. In addition to providing customer service, comfort, and refreshments to passengers, flight attendants keep everyone on board safe. They help conduct pre-flight safety checks, demonstrate the use of seatbelts and other safety equipment, and keep passengers calm during an emergency. If things do go wrong in the air, they may even save lives, getting passengers medical attention or making certain that everyone evacuates the aircraft safely if necessary. So, it’s not an easy job, but if you love to travel, have the ability to manage stressed-out travelers, and can keep cool under pressure, it might be the perfect job for you. 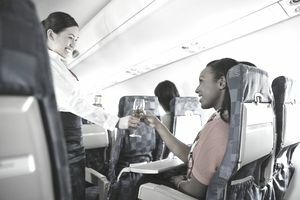 To become a flight attendant, you’ll typically need a high school diploma, customer service experience, and the ability to pass a background check and pre-employment drug screening. Then, you’ll embark on three to six weeks of training and become certified by the FAA. To get hired as a flight attendant, you’ll have to ace the job interview. Learn more about the types of interview questions a flight attendant might be asked, advice on how to prepare for an interview, and a list of specific interview questions. Flight attendant interviews may include a number of question types. Many will be common interview questions you might get at any job, such as questions about your employment history, your educational background, your skills and qualifications for the job, and your goals for the future. You may also be asked questions about you personally, including questions about your personality and work style. These might also include questions about why you chose the career you did. Some of your interview questions will also be behavioral. Behavioral interview questions ask you to explain how you dealt with past experiences on the job. You will likely also be asked situational interview questions. These are similar to behavioral interview questions, in that they ask you about different work experiences. However, situational interview questions are about how you would handle a future situation related to your job as a flight attendant. Finally, you might be asked questions about the particular airline for which you are interviewing. To prepare for your interview, make sure you know the requirements of the job. Look back at your resume and list any experiences you have had that demonstrate your ability to meet those requirements. This will especially help with behavioral and situational interview questions. Before the interview, do some research on the company you are interviewing with. Make sure you have a sense of their mission, the population they work with, and the company culture. Potential personal interview questions include "What made you want to be a flight attendant?" and "Do you consider yourself a good team player?" Give me an example of a time when you dealt with a customer who made an unrealistic or unreasonable demand. Tell me about a time that you dealt with an angry customer or client. What would you have done differently? Tell me about the last time you lost your patience at work. Describe a conflict you had with a coworker. How did you resolve the conflict? Describe a stressful situation in which you had to use your verbal communication skills to resolve the issue. Imagine you see a passenger being deliberately rude to another flight attendant. How would you deal with this situation? Imagine you saw two passengers disputing over their seats. How would you handle this? How would you deal with a passenger who refused to follow the rules (keeping his seat belt buckled, etc.)? How would you handle a very anxious passenger who is afraid of flying? Why do you want to work for our airline in particular? What do you think makes our airline different from others? Why are flight attendants essential on an aircraft? What do you believe makes excellent customer service?